After successfully calculating your case, you can add it to your cart. 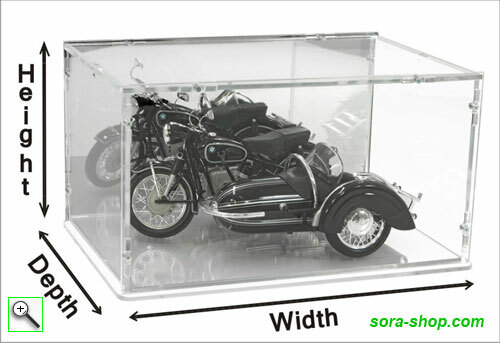 Product Information "Made to Measure Display Case"
Do you have a prized model ship, motor bike, or car that you would like to show off in your living room? Or perhaps a beautiful mineral specimen or piece of sporting memorabilia that you would like to display for visitors? Many individual specimens do not fit neatly into pre-made cases, so if you would like an attractive, affordable case that suits your pride and joy perfectly, why not order a Made-to-Measure Display Case? Many customer send us pictures of how they use their custom made display cases. Looking for inspirations? Then you might like to visit our Customer Gallery. Prices for custom cases begin at €29, and vary according to the size and features you are looking for. Best of all, there’s no need to wait to find out how much your dream case will cost! By using our customisation tool, you can calculate the exact price and, if you’re satisfied, add it straight to your shopping cart so that we can begin making it for you as soon as possible. 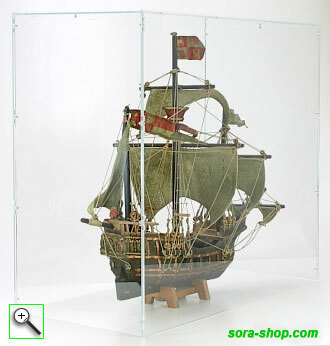 Due to the nature of acrylic panels, some combinations of dimensions (eg, a case which is 75cm tall and 75cm wide) are not possible. Making cases with these combinations would be very likely to result in breakages, which of course we work hard to avoid. Other combinations are possible, but may result in a different shipping option being used (our standard shipping option can only handle packages of certain sizes). If you select a combination of dimensions that could cause problems, an error message will appear. You may either adjust your chosen dimesions so that you can go ahead and order right away, or call Sora Shop on +49 36921 91434 to discuss your options with a staff member. If you have any questions or problems, please feel free to e-mail us on info@sorashowcases.com and one of our friendly staff members will be able to help you out. Step One: Choose between a display case with a base or without a base, and select your choice from the drop-down menu. Step Two: Choose the type of back panel you would like for your case: transparent, reflective or black. Think carefully, because this will affect the appearance of your display. You may like to look at the sample pictures provided on this website to get an idea of what the different back panel options look like. Step Three: Decide how wide you want your case to be, and select the appropriate number from the drop down called ‘Width (Inside)’. Then, select how tall you want your case to be, and select the appropriate number from the drop down called ‘Height (Inside). Finally, decide how deep you want your case to be, and select the appropriate number from the drop down called ‘Depth (Inside)’. Step Four: Click on ‘Calculate Now’ to produce a list of the specifications for your custom case. If there is a problem with something you have entered, an error message will appear, explaining what you need to do to fix it. If everything is fine, you will see a summary which outlines the selections you have made and provides the price for your custom case. Step Five: If you are ready to order, go ahead and click on ‘Add to Shopping Cart’, then click on ‘My Shopping Cart’ to review postage costs and check out. Alternatively, you are welcome to adjust settings as many times as you like until you find the custom case that perfectly suits your needs. Step Six: We will build your case and ship it to you in approximately five working days. It will arrive as an easy-to-assemble kit (with illustrated instructions included) and requires no tools or adhesives to put together. And remember: If you have any difficulties in the course of ordering a custom case, just call Sora Shop on +49 36921 91434 or email us on info@sorashowcases.com We’re always happy to help! Sora-Shop provide you with as many options as possible for you to design your display case with the exact features you need, making it individual to you. There are three different designs for the back panel - black, transparent or reflective. 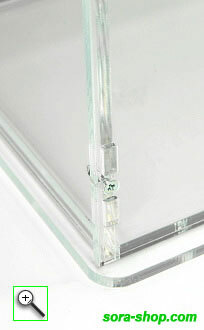 The acrylic showcases are based on a connector system. They are delivered as an easy to assemble kit and come with a fully illustrated construction manual. You can get an idea of how it looks when you browse the Construction Manual. 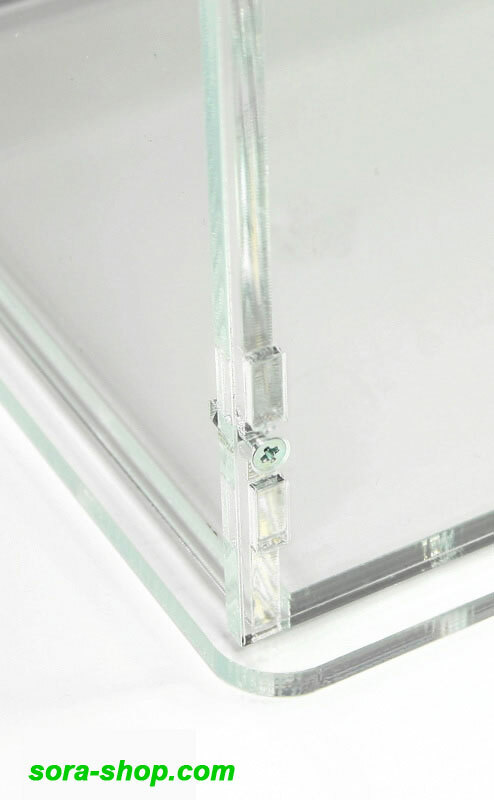 The acrylic cases are available with or without an acrylic base.bThe base consists of two 4mm thick, transparent acrylic panels, which are bolted together. The upper panel’s width and depth match the inside dimension of the case, so it fits in precisely. The lower panel measures 1.5 cm bigger on each side and has rounded edges. If your desired dimensions exceed the ones available on the online configuration tool, please send us your request via e-mail. We will then check the feasibility of your case and quote you an individual price in case of confirmation. 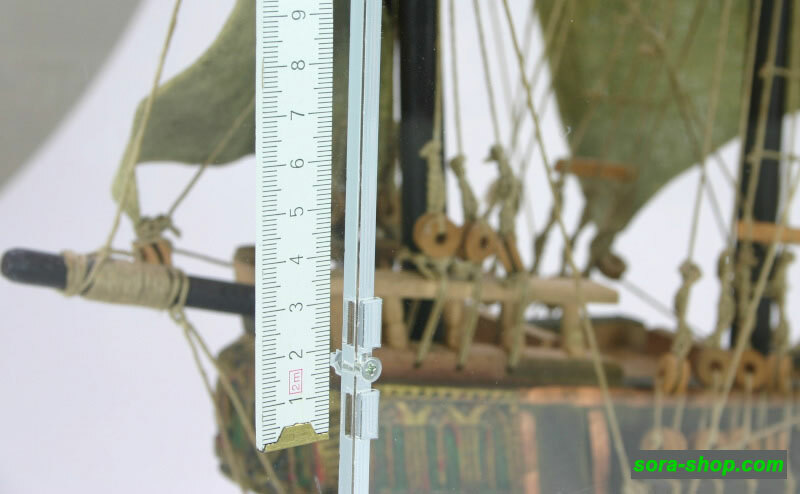 links to "Made to Measure Display Case"
customer reviews on "Made to Measure Display Case"
I have ordered a display case for my hobby collection, and i would like to thank you and your staff for amazing quality product and speedy delivery. I have considered few other cases from Trumpeter but quality not even close to what you get from Sora shop. Dont hesitate and order one ,you wont find better quality and value for money. 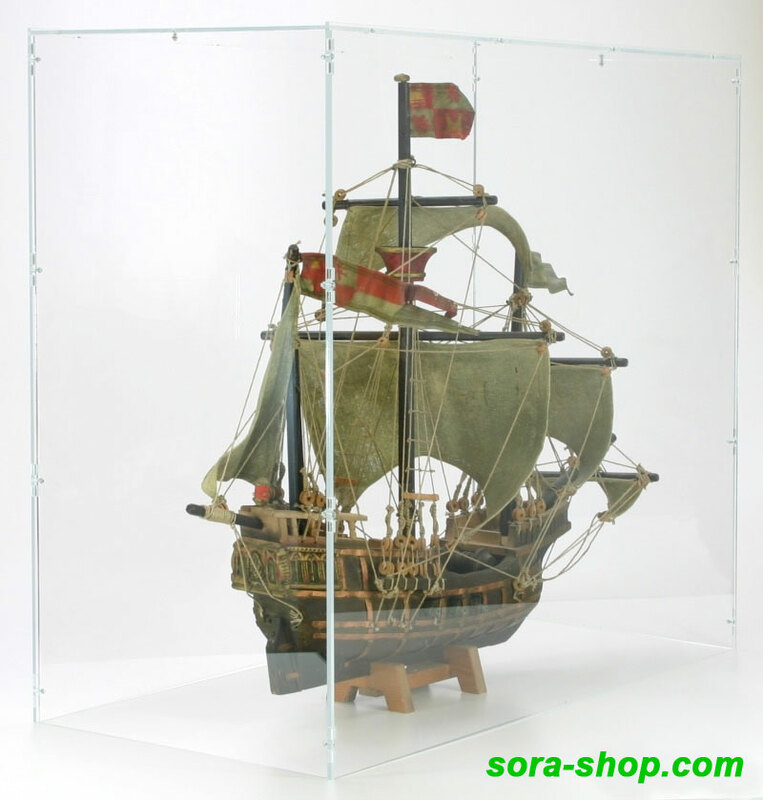 I recommend sorashop to all collectors who wish to protect their treasure was dust. Very satisfied with the product and order tracking. The site is well designed to achieve its custom display and no surprises on delivery. rapid realization in my case, ordered on Tuesday and parcel received on Friday !! Je recommande sorashop à tous les collectionneurs qui souhaitent protéger leur trésor de a poussière. Très satisfait du produit et du suivi de commande. Le site est très intuitif pour réaliser son display sur mesure et pas de mauvaise surprise à la livraison. Réalisation très rapide en ce qui me concerne, commandé le mardi et colis reçu le vendredi !! Order sent Monday received Thursday, quality excellent, easy assembly, cheaper than many other places I would recommend Sora Shop without hesitation. Great case, custom sized for a collection of Steiff soft toys - very fast delivery to the UK, went together very quickly with a perfect fit, and price really good too! Many thanks! I will certainly buy again. What a great case. 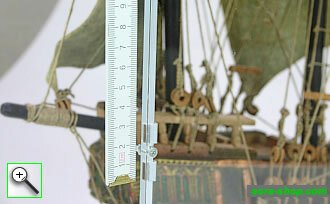 Needed one for my model boat, nowhere in the UK could I find a display case. Then I found this. This is a great case, fast delivery, excellent quality all worth the money I paid which was a lot cheaper than other places. Well done Sora Shop. Great product. Delivery was unexpectedly quick. The parts were precision-cut, and went together easily. The overall quality I would rate as excellent, as was the value-for-money. I would use Sora-Shop again, and recommend them to anyone.